Throughout the 1950s, most major aircraft manufacturers in the United States were anticipating the application of Vertical Takeoff and Landing (VTOL) technology to many conventional forms of military aircraft. The ability of VTOL aircraft to remain safely dispersed at small operating sites without the need for cumbersome and vulnerable airbases and aircraft carriers in an age of ballistic missiles and atomic weapons encouraged substantial research grants by the armed forces. An aircraft with a thrust-to-weight ratio greater than "1" could easily launch vertically, and once airborne, transition to horizontal flight for completion of its mission. The Ryan Aircraft Corporation attempted to convert this idea into a practical fighter for the Air Force with its X-13 Vertijet, but like most other VTOL aircraft, the performance compromises made for the vertical capability did not warrant its introduction over more capable conventional aircraft. The idea for the Vertijet originated just after World War Two when engineers for Ryan were casually debating whether their FR-1 Fireball, which had a thrust-to-weight ratio of "1" at low fuel quantities, could take off vertically. The vertical take-off idea soon advanced beyond the discussion stage and, in 1947, the Navy's Bureau of Aeronautics awarded Ryan a contract to investigate the technical challenges involved the development of a vertically launched fighter jet. This transpired as part of a program to investigate the feasibility of submarine-launched aircraft. Ryan's engineering studies revealed that such an aircraft was feasible and could be easily controlled while hovering vertically with a reaction control system that diverted exhaust gasses in the appropriate direction. A subsequent Navy contract funded construction of an unmanned flying demonstrator. This ungainly contraption, powered by an Allison J33 turbine, and known affectionately as the "beast in the back yard," used a ball mounted nozzle to provide reaction control while hovering. In 1953, engineers transformed a B-47 fuel tank into a cockpit to allow test pilot Peter Girard to evaluate the test-bed's suitability as a manned research aircraft, which sat on its tail to take off in a vertical attitude. 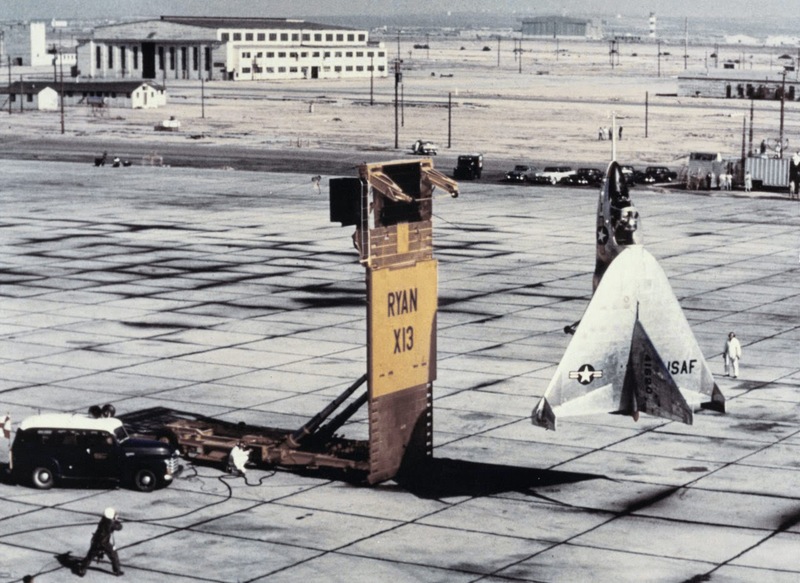 After Navy funding ran out, the Air Force became interested in Ryan's experiments and in July 1954 issued the company a contract to construct two VTOL tail-sitter demonstrators, designated as the X-13 Vertijet. This project, based on the earlier Navy design proposal, was to demonstrate the suitability for this type of aircraft as a fighter. The X-13 emerged as a compact, single-engine, delta-wing fighter. The only unusual feature visible to the casual observer was a set of winglets. 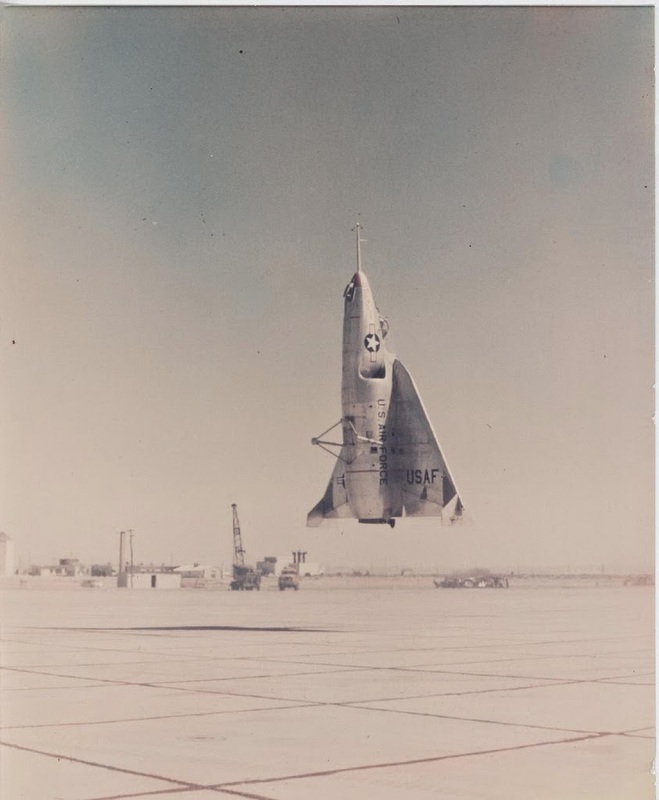 The engineering team, led by Robert Fuhrman, designed the aircraft to travel on a special trailer, which would tilt vertically for the launch and recovery of the X-13 during vertical takeoffs and landings. While the use of jet thrust for VTOL aircraft was new, Lockheed and Convair with their respective XFV-1 and XFY-1 (see NASM collection) turboprop fighters had already validated the tail-sitter concept in which a conventionally configured aircraft took off in a nose-vertical attitude. The greatest flaw with the tail-sitters was the difficulty in landing due to the obscuration of the pilots vision by the airframe, which made it difficult if not impossible to adequately judge the distance to the ground without outside assistance. By late 1955, Ryan completed the first Vertijet (s/n 54-1619), and on December 10, Girard flew it on its maiden flight. For its initial testing, the X-13 sported a fixed tricycle landing gear and flew as a conventional airplane. 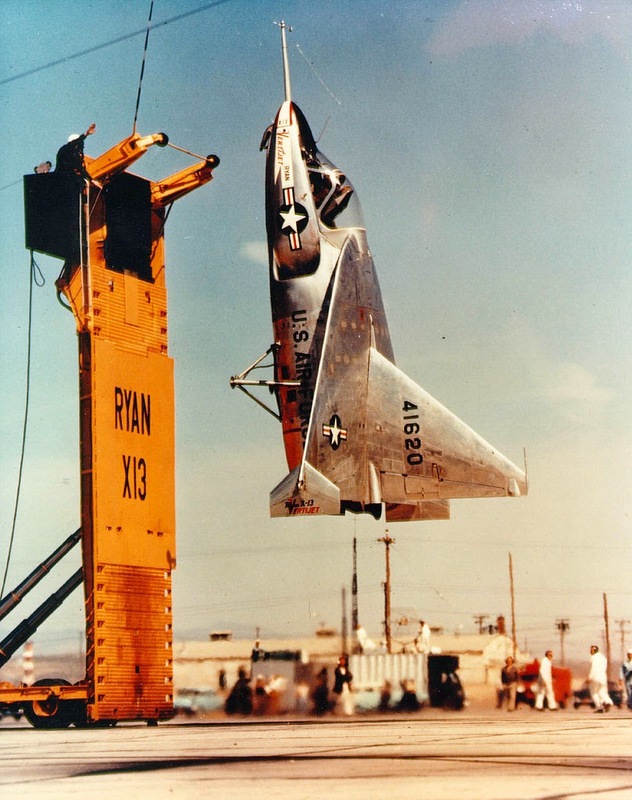 Fuhrman and his team did not want to risk vertical flight-testing until they had thoroughly explored the X-13's conventional handling characteristics. After the installation of dampers solved oscillation problems revealed during this phase of the testing, engineers added a steel-tube truss with castering wheels to the rear of the X-13. This allowed the aircraft to sit on its tail during the vertical flight-testing phase without the need for the complex launch and recovery procedures inherent to the launch trailer. 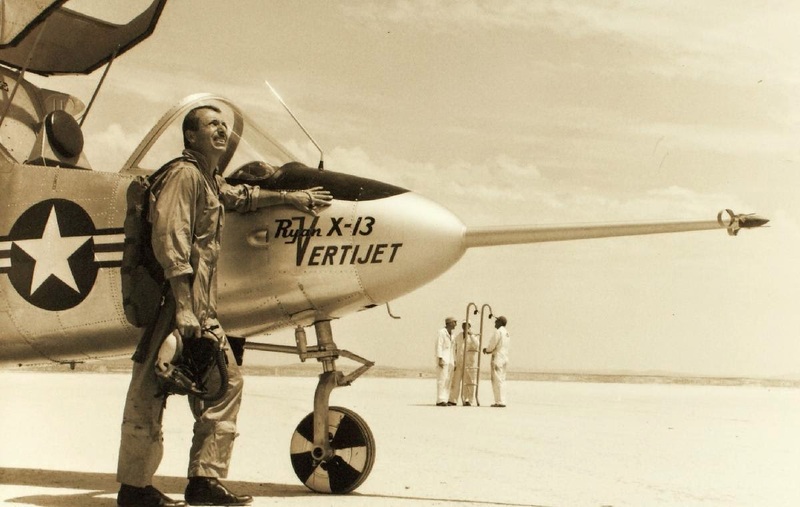 Pete Girard made the first vertical takeoff and landing on May 28, 1956. On the same day, the second X-13 made its first flight. In conventional flight, elevons and a rudder controlled the X-13. As the aircraft transitioned to a nose-high attitude to "hover" on the thrust from its own engine, a vectorable exhaust nozzle linked to the controls provided a simple and effective means of control. Small bleed-air thrusters mounted on the wingtips allowed for the small adjustments to the pitch and yaw of the aircraft required by the tricky landing process. 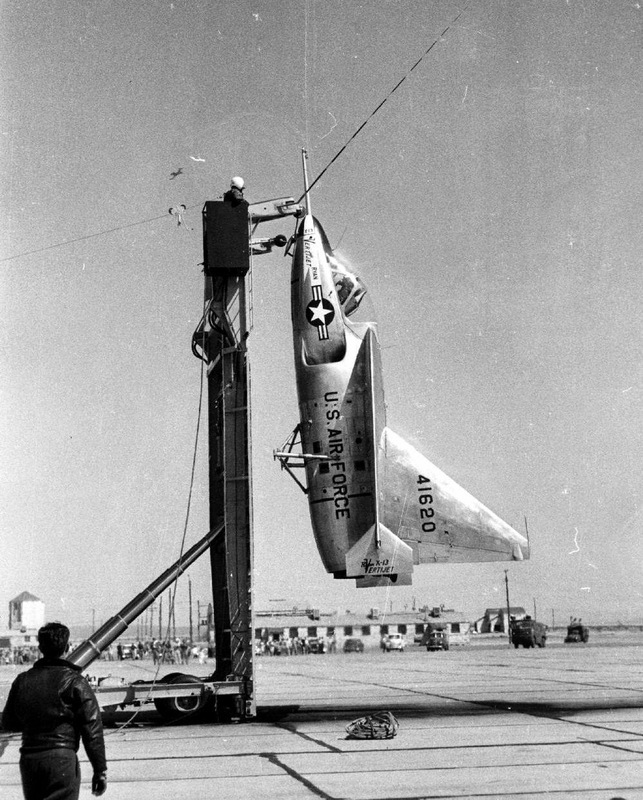 The vertical takeoff procedure consisted of elevating the bed of the launch trailer vertically, which allowed the X-13 to hang from a cable suspended by two arms on the top of the trailer with a partially retractable hook. For vertical operations, a flat bumper replaced each the main wheels on the landing gear, which kept the underside of the fuselage from damage if it swung into the bed of the trailer and made transport easier. The pilot then simply increased throttle until the hook lifted off the launch cable, backed away from the trailer and then accelerated vertically and smoothly pitched over to conventional flight. However, vertical landings were more difficult and probably the most impractical part of the Vertijet concept. The pilot had to approach the recovery trailer blind with the underside of the fuselage facing the surface of the trailer. Constant radio communication with a ground observer was required to talk the X-13 into position. A (20 ft) long folding pole with marked gradations attached to the top of the recovery trailer gave the pilot a clear indication of the distance remaining before he contacted the trailer. Once in position, the pilot slowly retarded the throttle until the nose hook caught the recovery cable. During the summer of 1956, Girard began practicing the techniques required to hook the cable on the launch and recovery trailer by hooking a one-inch thick rope strung between two towers. On November 28, he made the first transition from horizontal to vertical flight and back again in the X-13. On April 11, 1957 Girard launched from the trailer, transitioned to conventional flight and returned to the trailer for a vertical landing. On July 30, 1957, the second X-13 put on an impressive display at the Pentagon for over 3,000 military officers and journalists. However, competing programs reduced the funds available to continue the project, and by early 1958, the program ground to a halt. 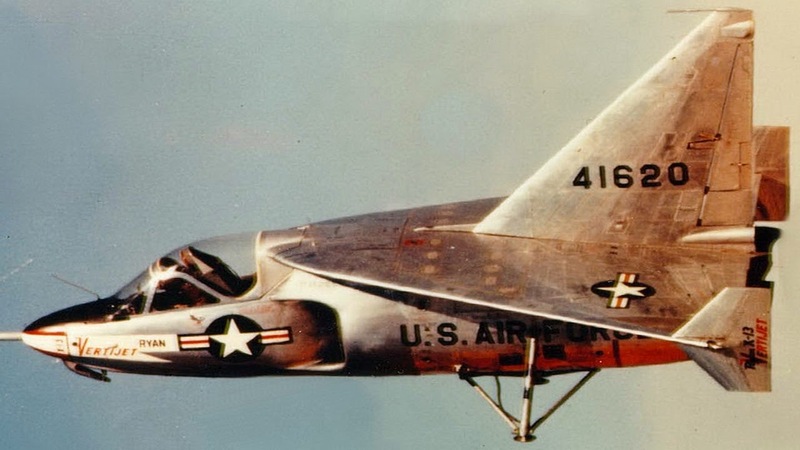 While later programs such as the XV-6 Kestrel experienced greater success, the X-13 was probably the most effective solution to the problems of creating a VTOL fighter at the time. The Vertijet accomplished all of the tasks set out for it. Ryan donated the first X-13 to the Smithsonian Institution in 1960.